It is my 60th birthday month! There will be celebratory dinners, spa visits, lunch with friends and weekend getaways. Last evening we enjoyed a special dinner with our dearest friends. It was a real challenge to take photos in front of the bank near my house due to the whipping winds. We try to take photos before I get all rumpled from sitting in the car, that's why our backgrounds are often the same. A few subtle changes in my style will come about in the next season of my life. Scarves will be added to my look a lot more often. Wearing a scarf in colors that flatter your complexion is an easy way to add color and pattern without wearing a print over your whole body. Black, white and denim are my neutrals and the largest blocks of color in my wardrobe. None of these colors are especially flattering close to my face. The good thing about my base of neutrals is that I can pull in small doses of the colors that are more flattering. The basis of great style is taking suggestions from trends or outfit ideas and making them work for your shape and your lifestyle. I have been collecting colorful scarves and tanks for years. Wearing a tank (over the correct *bra) with a color coordinated beautiful silk scarf tied simply near my face can make almost any combination of base pieces work together. You will find many beautiful scarves here. *The bras that work best for me are the Ultimate Shapeez Bra for long-line smoothing. When all else fails, go across the street inside the Post Office to take a closeup without the wind whipping your hair all over your face. The shot above includes the portrait area. Keeping the scarf in this area avoids adding more bulk to my bust. If I am wearing a larger scarf with more texture for warmth, I will tie or wrap it so that it hangs in smooth straight lines rather than adding more fluff where I am already "fluffy". Subtle makeup, a simple hairstyle, not too much jewelry, a soft supple silk scarf in vibrant jewel tones and less stress are all elements that I plan to enjoy in the coming years. The long duster cardigan is from White House|Black Market. The tank and the pants are old from Chico's. The shoes are old by Sam Edelman. The earrings are old by Brighton. The ring is a long-ago gift from Mr. Mickey. My scarf tying techniques are always simple and easy. This one is a long rectangle shape, so I just wrapped it around my neck twice and tied the ends loosely. On Saturday, a Mercedes-Benz car show was held on the grounds of Shelton Vineyards located in Dobson, North Carolina. Sitting in the shade and visiting with people was a popular way to pass the time between looking at beautiful cars. I borrowed one of Mr. Mickey's hats and wore the black tank from my collection with old white jeans from Chico's. The bag is from Uno Alla Volta. The hand-painted silk shawl is by Tina Gleave at the Silk Squirrel. The flat silver trim sandals are old from DSW. I do not usually stroll through a park when it is ninety-two degrees so getting dressed for this event was a bit of a challenge for me. I knew that if we went inside, the air conditioning would quickly become too much for me, so the shawl was a welcome addition as we were having lunch. After looking at every car, petting every dog and visiting with lots of special car owners, we rested for a moment before starting out on our next adventure for the day. If you grew up in America during the sixties, you probably watched The Andy Griffith Show a few times. I was born in North Carolina where Mayberry was supposed to be located. My family always felt as if this show was starring our people. The beautiful little quaint town of Mount Airy is best known internationally as the birthplace of Andy Griffith and the inspiration for the fictional community of Mayberry on the show. Regarding the tone of the show, Griffith once said in a 'Today Show' interview, that despite a contemporary setting, the show attempted to emulate nostalgia. "Though it was shot in the 1960s, it had a feeling of the 1930s." All words, styling, and creative direction are my own. I no longer accept products in exchange for reviews. Do you ever just do nothing for the whole day? Yesterday was one of those rare Sundays that included nothing more than reading the paper, taking a nap, then going to visit my parents. My sister and I honor a long family tradition that includes taking the time to visit with our parents on most Sunday afternoons. (As we did with my grandparents and great-grandparents as children.) We call them almost every day to make sure they are both well and don't need our help with anything. Going for a long walk and then watering the shade garden typically happens at daybreak but not on this day. I also fill the birdfeeders and put fresh water in the bird bath before I start my usual work days. I worked seven days a week for many years. Taking these little breaks for something less taxing helped to keep me sane. Personal rituals and traditions give me balance and ground me. For example, giving thanks for all that I have and taking the time to exercise always starts my day on a positive note. On hot summer days with nothing special planned, I always wear something breezy and comfortable. The cool, soft, comfortable top is by Focus, and the khaki pants are the "Lize" style straight leg pants by Lior Paris both via ShopMyFairLady.com. They offer most of the clothing lines I enjoy wearing with always excellent service included, so I remain loyal to them. The sandals are old from Nine West. We visit Abingdon, Virginia a couple of times every year. My travel day look included a navy whisper light cardigan by Focus via ShopMyFairLady.com over an old tank by Peck & Peck via Stein Mart. The olive color pants are old from Fabrizio Gianni. The necklace and bracelet are by French Kande. The bag is old by BCBG via T.J.Maxx. The shoes are old by Gianni Bini from Dillard's. Abingdon is only a short drive from Johnson City, but far enough to feel as if we got away from it all for a few days. The Martha is always our home away from home in Abingdon. It is an elegant place to relax on the porch and watch the world go by, get a massage or have dinner. On Friday evening we had an excellent meal at the Tavern which is a short distance from the Martha. The clutch is from Cloth, the boutique at the Grove Park Inn, in Asheville, North Carolina. The French Connection shoes are old from Saks Off 5th. We occasionally enjoy a piece of wild caught salmon for dinner. It is an excellent source of vitamin B12, vitamin D, and selenium. Salmon is a good source of niacin, omega-3 fatty acids, protein, phosphorus, vitamin B6 and also a good source of choline, pantothenic acid, biotin, and potassium. The moss-covered building which houses the Tavern dates to 1779! On Saturday morning we enjoyed a Continental breakfast in Sister's American Grill, the restaurant at The Martha. After breakfast, we took a stroll around the grounds before going down to the Spa for our massages. During the early part of the day, I wore my Last Tango cold shoulder top from Purple Poppy over white Lior Paris Janet style pants from ShopMyFairLady.com. I had so much fun exploring the grounds of the Martha after a gentle summer afternoon rain with my camera in hand. One of Mr. Mickey's favorite things ever is deviled eggs. Sister's American Grill makes some of the best ones ever! That's where we had a lovely evening meal on Saturday. I wore the white pants again with the white tank top from day one with an old blue cardigan from Saks Off 5th. It has a sheer panel at the lower back. When we travel for a short distance and stay for one or two nights, I take only a few pieces that can be mixed and matched. I will only be dressed in the pieces for a couple of hours so they can be switched about easily, wearing the pieces in rotation on different days at different times. 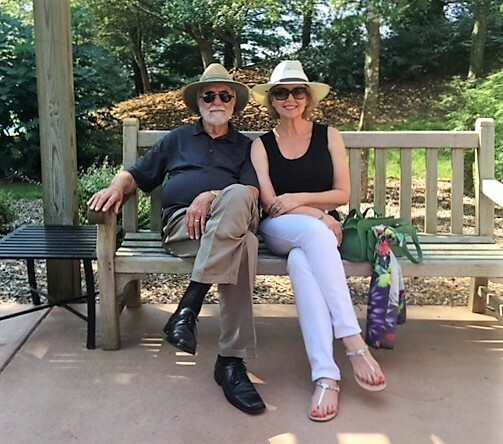 On Sunday we had an excellent brunch at the Harvest Table in Meadowview, Virginia before attending the afternoon showing of "Mamma Mia!" at the Barter Theatre. We thoroughly enjoyed the play! If you get the opportunity to see this musical, do. You will not be disappointed. Later in the afternoon on Sunday, we also walked through the craft show booths at the Highlands Festival. 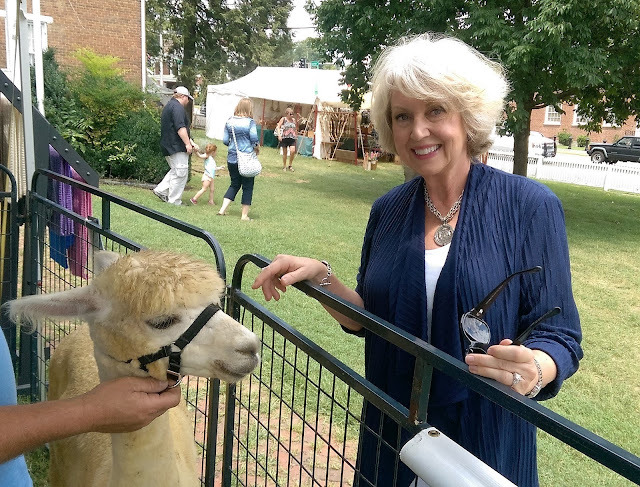 My favorite booth was the Dreamland Alpaca Farm Store where I got to pet an Alpaca for the first time. What sweet temperaments these animals have!